1730 Accurata delineatio celeberrimae Regionis Ludovicianae vel Gallice Louisiane ol. Cauad' et Floridae adpellatione in Septemtrionali America. 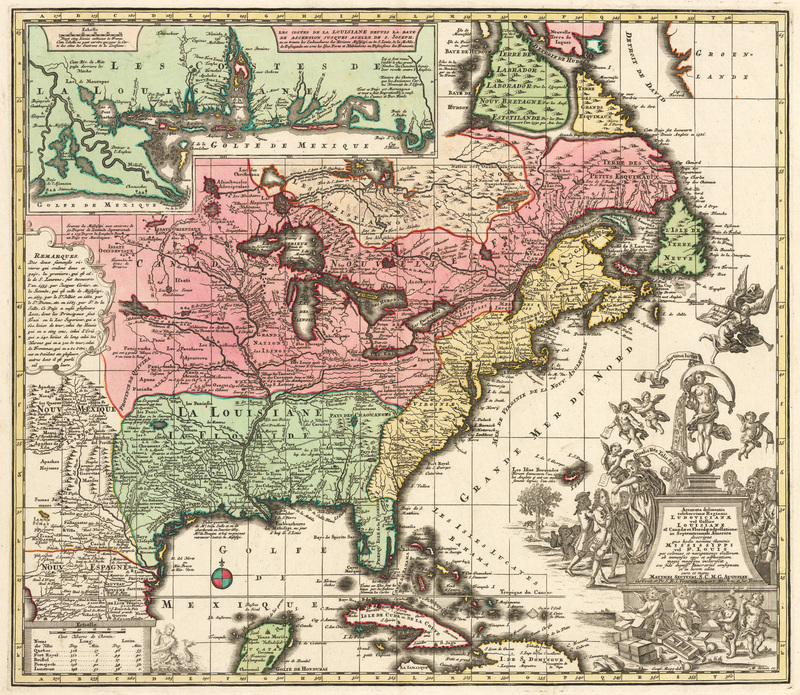 This remarkable map of North America spans from the French-controlled northeast coast all the way to Spanish-controlled New Mexico and New Spain. It depicts what was known of the territories shortly after the collapse of the speculative frenzy known as the Mississippi Bubble, and in fact the title cartouche tells the story of the investment bubble and its aftermath with a few well-chosen allegorical figures. Seutter delineates all known European and Indian settlements of the day in great detail, and includes countless names of tribes in the territories they occupied. Though in French, the place names and descriptions are easy to understand as they are close to their English language equivalents. For example, he calls a region in the northeast Terre des Grands Esquimaux, the Land of the Great Eskimos, while just to the south is a region called Terre des Petites Esquimaux. the Land of the Small Eskimos. Major roads and trails are shown, the Great Lakes are all in place, and the great system of rivers, streams and other waterways that create the Mississippi is depicted with great care. The upper left quadrant features an inset map of the Louisiana coastline, from the Mississippi Delta to Florida, providing much detail of the coastline of the area. The lower right quadrant features a title cartouche which tells the story of the scandalous Mississippi Bubble which brought financial ruin to so many wealthy and middle class Europeans in the early 1700s. While Faith pours riches from a large cornucopia, wealthy investors buy stock from winged cherubs and receive their shares from a beautiful maiden. Opposite them we see the ruined investors expressing grief and distress. Below the cartouche a foursome of cherubs merrily cut the shares to pieces amidst in a slightly chaotic atmosphere. The company which caused the crash had been created by a wily Scotsman named John Law, who managed to create a monopoly which completely controlled France’s colonial trade, which was called the Company of the Indies, in which he offered shares on the open market. The potential for gain seemed so great that a bubble swiftly ensued and as do all bubbles, it burst leaving countless families penniless and others seriously impoverished. While Faith pours riches from a large cornucopia, wealthy investors buy stock from winged cherubs and receive their shares from a beautiful maiden. Opposite them we see the ruined investors looking on as a cherub dangles an empty purse before them. Below the cartouche a foursome of cherubs merrily cut the shares to pieces amidst in a slightly chaotic atmosphere. Condition: This map is in A condition with beautiful original hand coloring on water marked paper. The paper is clean and strong with wide margins. There are no discernible faults except for a small rust stain in the lower left margin.